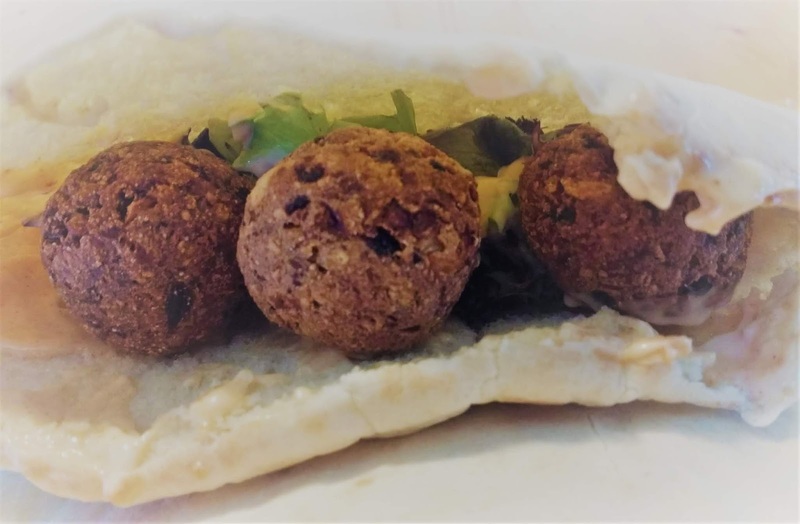 There are falafel recipes all over the internet, so there's not much point in this one, especially as it isn't vegan. But if you're not vegan, the egg makes it much easier to handle, and it's really tasty. I've been making these for so many years that I've got no recollection of where the recipe came from, but I'm sure I've accidentally modified it over the years. It uses tinned chickpeas for ease and lack of forward planning, and is closely related to my vegetarian sausage recipe. This is much easier to do if you have a processor, a toaster and a deep fat fryer, although you can mix the ingredients by hand, warm the pittas in the oven and fry the falafel in a wok. But you know, life's too short. It should make enough for six to eight pittas; any left over falafel can be frozen. It's best to fry it a bit first. You can fry it again when you want to eat it - the ones in the picture were frozen and re-fried because I forgot to take the picture the first time. Also there weren't quite enough left because we ate too many first time! It's important to rinse drain the tin of chickpeas really well otherwise they're a bit slimy and smell of dog food. No idea why that is. Preferably tip them into a sieve and rinse under the tap then leave to drain for a while over the sink. Or shake furiously if you're in a rush. You can use harissa instead of the spicy paprika if you like it spicier, and if you can find it. I'm pretty sure this would work as vegan if you leave out the egg, but cool the mixture for a while first because otherwise it'll be impossible to handle. Plus of course lose the mayonnaise. Tahini would be a good substitute, and appropriate. More correct than the rest of the recipe in fact. Cut the crusts off the bread and cut into chunks. Process into coarse breadcrumbs, just until there are no big lumps left. Peel the garlic and onion and cut into chunks. Add to the processor along with ground coriander and the herbs. Crack an egg on top and process until it's fine enough to stick together but not smooth like a dough. You will have to stop the blade and scrape the mixture off the sides a couple of times. With clean damp-ish hands, take a dessert-spoon full of mixture and roll into a ball. Place it on a dry board and repeat until all the mixture is used. It won't hurt to let them dry a little because it makes them easier to handle. To make the sauce, just mix some spicy paprika with mayonnaise until you like the flavour. This bit is easier with two people, but if it's just you cooking put the oven on to keep the falafel warm. Fry the falafel in sunflower oil at 180 degrees. I lower two or three at a time in with a slotted spoon, until the bottom of the basket is covered. Once they've cooked for a few seconds they will be pretty robust. Cook until they are nice and brown, then lift out onto a piece of kitchen paper to drain. Warm the pittas in the toaster until they expand, cut a slit in them like the guy at the kebab shop does and put salad and sauce in the bottom. Add the falafel and eat straight away. That's it - don't wear your best shirt because you will definitely drip sauce down it. A blog about the current state of the nation and what I cooked for dinner, plus occasional holidays. © Richard Stubbs 2019. Simple theme. Powered by Blogger.